In August 2012, the British Broadcasting Corporation aired a documentary called Eat Fast and Live Longer. 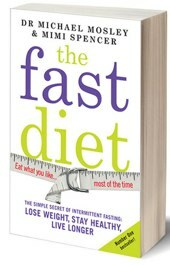 The show was the brain-child of Dr Michael J. Mosley and documented his experiences with intermittent fasting. The program was an instant hit that attracted three million viewers, and the fact that Mosley lost an impressive 20 pounds in 9 weeks ensured that his system, The Fast Diet quickly became a new British and European dieting sensation, that already looks set for global success. This type of eat-starve-eat diet is nothing new, it has been around for a long time and the periods for eating and fasting vary from system to system. Mosley’s system allows five days of eating normally followed by two days of fasting—hence the name. 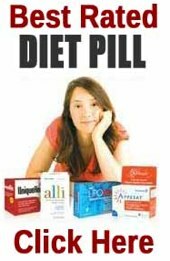 It is also known as The Mosley Diet—for obvious reasons—and The Fast Diet, after the book Mosley co-wrote with Mimi Spencer (published January 2013). 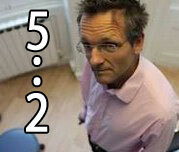 Michael Mosley is a medical journalist who often participates in his own experiments. 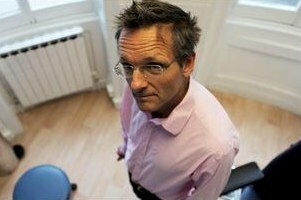 His work is often followed by the BBC’s Horizon team who have carved out a niche in the health genre. Mosley is well informed, articulate and extremely likeable. It is not unsurprising that his book has been a huge success. Mosley researched many of the studies that had already been conducted on fasting as it relates to weight loss and the aging process. He also interviewed some of the original researchers and then, using himself as guinea pig, began experimenting with different periods of fasting until he became convinced that 5:2 was the most effective ratio. Mosley has a very interesting, and equally logical, theory why intermittent fasting can be so effective. He suggests the human species evolved to survive on a feat/famine eating schedule. In less civilized days man the hunter was not always successful in the hunt for food and if there was no kill he was forced to go hungry until the next successful hunt. Man’s ancestors adapted to this intermittent eating pattern and Mosley believes it remains the inherently correct system to maintain perfect health and weight. A great deal of research has been conducted into intermittent fasting and the many different ways it may benefit the body. It is believed that the first studies began in the 1930s when experiments on mice revealed that restricting the mice’s calorie intake resulted in an increased life span. To this day, nobody has been able to ascertain why these results occurred, but it has been theorized that the answer may lie in the blood’s IGF-1 hormone levels. Reduced calories may lead to a reduction in the hormone level. This is relevant because prior research had revealed that a drop in IGF-1 causes the body to turn on cellular repair mechanisms that may then protect it from cancer, heart disease, and many other potentially fatal illnesses. In a more recent study tests were conducted on a group of thirty obese women, all of whom were known to have a high risk of developing heart disease. The women were fed a diet of low-calorie liquid meals six days a week, followed by a day of fasting (consuming no more than 120 calories). After eight weeks had passed the average weight loss was an impressive 8.8 lbs. Some tests would also appear to support the claims that intermittent dieting can prevent cognitive decline in humans, but many experts remain unswayed by the results because all of the tests were conducted on animals, not humans, and in one case the test subjects were genetically engineered mice. There have ben many articles written about the Fast Diet with a majority being positive. Those that aren’t are trying to highlight the obvious. 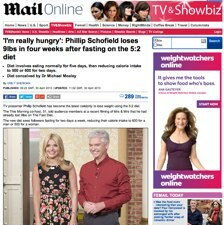 UK readers would have probably read about or watched Philip Schofield’s weight loss. The This Morning presenter shed 9lbs while on te diet but admitted to feeling hungry (no pain no gain Philip). It may be true that early man became used to a feast/famine lifestyle, but that was a long time ago and many people today may find fasting difficult. It requires a level of self-discipline that can be hard to sustain and it is possible that some dieters who fail to follow through on their good intentions may end up feeling like a failure, which may lead to self-esteem issues. Other known problems associated with a restricted calorie intake include: Bad breath, anxiety, problems sleeping, dehydration. There is alos concerns the body may be starved of essential minerals and vitamins during its “2” days. 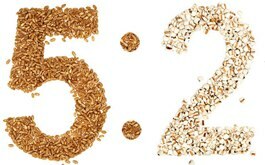 Despite the fact that such a restrictive eating pattern can be hard to live with many practitioners of Mosley’s 5:2 system swear by it and his list of followers includes several big-name celebrities, including Beyonce Knowles, Jennifer Lopez, and Ben Afleck; so 5:2 has certainly made a big impact on the dieting world in a relatively short period of time. The Fast Food Diet book was recently released in the States and it is already one of the top-ten best-selling books on Amazon.com. Arguably the diet with the most chance of success. Providing will power is not lacking weight loss should be inevitable. Mosley’s Book “East Fast and Live Longer‘ is a well worth a read – I defy anyone not to question their eating habits a few pages in. Its available from Amazon or WH Smiths at around a tenner. The criticisms that have been levelled at “fasting diets’ is that they are hard to sustain and they could deprive your body of valuable and essential nutrients. 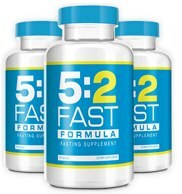 There is a product available that is an ideal companion – it is called the 5:2 Fast Formula and can suppress appetite taking away the hunger pangs and replenishing lost minerals and vitamins.